This was a 14 day cruise around the British Isles from Southampton, England. The port of calls were Rotterdam; Edinburgh; Invergordon; Glasgow; Killybegs; Belfast; Liverpool, Dublin and St. Peter Port. The Queen Elizabeth is a sophisticated cruise ship that provides a cruise experience derived from the great transatlantic liners of the 20th century. Her public areas are elegant and the dress code is more formal than most other cruise ships. In addition, the programming has a cultural element not found on many ships. However, the ship also provides a relaxed resort experience during the day with pools, spa, bars and lounges and other contemporary amenities that you would expect to find on a modern cruise ship. Queen Elizabeth has a somewhat different personality than her fleetmate Queen Mary 2. While both have a British flavor, QM2 has a more international feel. Indeed, at times QE can seem like an up-market version of the essentially exclusively British P&O Cruises. 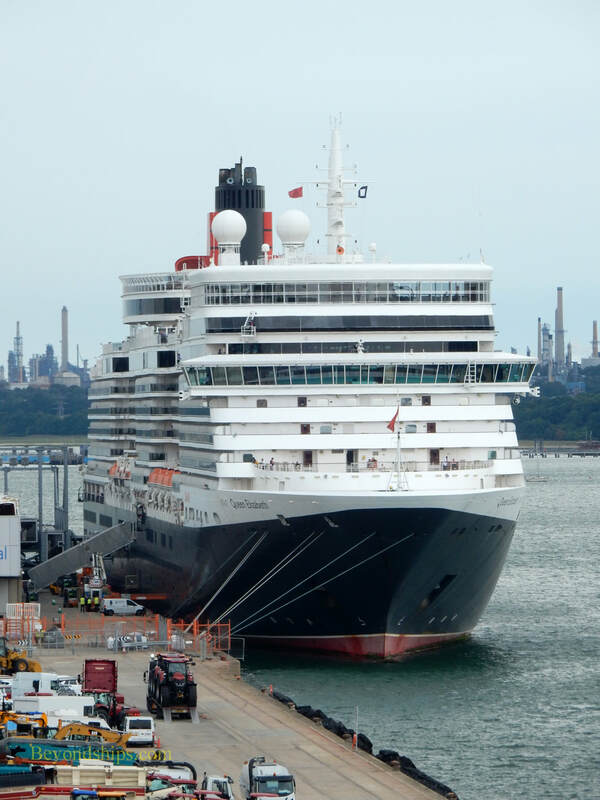 QM2 is also a about a third larger than QE and so has more facilities (e.g. a planetarium) than her smaller fleetmate. At the same time, however, QE's smaller size attracts quite a few guests who say they prefer her more intimate size. In addition, because QE is a cruise ship rather than an ocean liner, her interior did not have to be built around structures needed to strengthen a ship against North Atlantic storms or to give her the greater speed a liner requires. As a result, QE's interior is easier to navigate than QM2's interior. A majority of the passengers on this voyage were from the UK. However, there were also substantial numbers of Americans, Australians and people from Continental Europe. Most passengers were mature and there were very few children. Queen Elizabeth presented a full program of entertainment and activities. During the sea days, there were lectures on a variety of topics including the history of ocean liners and the struggle for votes for women. British poet and entertainer Pam Ayers gave a series of talks to capacity audiences in the Royal Court Theatre. In the evenings, there were musical revues by the ship's production company or performances by visiting entertainers. There were also receptions and dancing in the ship's large ballroom. Dining is an important part of a voyage on a Cunard ship. Which one of the ship's four dining rooms one is assigned to you depends upon your cabin category. Guests with the top suites are assigned to the Queens Grill. If you have a smaller suite, you are in the Princess Grill. Certain larger staterooms are in the Britannia Club. The majority of the passengers dine in the Britannia Restaurant. Unlike most cruise ships, the dining rooms are open for breakfast, lunch and dinner - - a definite plus. In the Britannia Restaurant, breakfast and lunch are open seating. For dinner, each guest is assigned to a specific table at either the early or late seating. We were at a large table with other guests traveling as couples and sailing solo. Although these people were strangers, there was good conversation each evening. At the same time, the service provided by our pair of waiters was prompt, efficient and unobtrusive. Of course, the Queen Elizabeth has alternatives to the main dining room. Its specialty restaurant is The Verandah, a pretty room with 19th century French accents and serving a French-inspired cuisine. It is open for lunch (sea days only) and for dinner. We had lunch there and thought it was a pleasant experience. However, the food and the service were not superior to the Britannia Restaurant. In addition, Queen Elizabeth has a large buffet restaurant offering a good variety of dishes and with a friendly staff. Each evening, a section of the buffet restaurant became an extra-tariff alternative venue devoted to a different cuisine such as Indian, Italian and “Classic American.” While these sounded interesting, they were not enough to tempt us away from the fine meals that we were having in the Britannia. Queen Elizabeth has several bars and lounges. Of these, the most impressive was the Commodore Club. Located high on the front of the ship, the Commodore Club is an observation lounge decorated with Cunard and nautical memorabilia. In the evenings, a pianist plays, mostly popular songs from the 1940s but he also slipped in a few songs by George Harrison. Having a glass of Laurent Perrier champagne, some strawberries and horderves while looking out at the Irish coast or the Scottish islands, is a truly memorable experience. Queen Elizabeth was in generally good condition. The ship's interior was clean and in good shape. On the exterior, there were few signs of rust. However, there was a beard of sea growth around the waterline. The sea conditions did not pose a challenge for QE. The ride was comfortable although QE - - like several of the other ships built to the Vista-class design that we have experienced - - has some tendency to lean slightly in some seas. While this cruise centered upon the British Isles, the first port of call was in the Netherlands. Queen Elizabeth docked at the cruise terminal in Rotterdam. From there guests were able to take excursions or go independently to Amsterdam, The Hague, and Delft as well as explore the city of Rotterdam. In addition to being a port of call, Rotterdam was the embarkation port for a significant number of guests from Continental Europe. These guests stayed with the ship after we disembarked in Southampton as Rotterdam was also on the itinerary for the Northern European cruise that followed this British Isles cruise. Edinburgh was one of two tender ports on this cruise. (The other being St.Peter Port). A large local tender was employed to ferry passengers to and from the ship. so even though it was a relatively long ride from the anchorage to shore, the ride was not uncomfortable. In addition, the captain of the tender pointed out points of interest in the Firth of Forth. From the tender landing at New Haven, guests could walk to the former Royal Yacht Britannia or take a local bus into the center of Edinburgh. Of course, thee was also an array of shore excursions on offer. Most passengers took excursions in Invergordon. The port is a small community a considerable distance from the nearest large city, Inverness. Furthermore, since most of the sights in the Scottish Highlands are in the countryside, it is not easy to explore independently. This was Queen Elizabeth's maiden call in Killybegs. Another relatively small community, most of the places of interest are scattered around Donegal or are just over the border in nearby Northern Ireland. As in Invergrordon, the ship docked within walking distance of the town so that those guests who wanted to stay close by the ship had places to explore. For Glasgow, Queen Elizabeth docked at Greenock. This is some distance from Glasgow but there is regular rail and bus service into the city as well as shore excursion tours. Greenock itself is a fairly large community with a long history. Representatives of the local tourist association met the ship and provided information as well as complimentary walking tours of their town. From the cruise port in Belfast, you could see the Titanic Museum, HMS Caroline and the remains of the Harland &Wolff shipyard. However, you are separated from them by water. In addition, the cruise dock is in a commercial cargo area. Therefore, it is best to take the complimentary shuttle into the center of town. Alternatively, one can take an excursion out into the Antrim countryside. There is a special relationship between Cunard and Liverpool. Whenever a Cunard ship is in port thousands of people come down to the riverside to see the ship. It is also a good excuse for a celebration. This call was on the anniversary of some seemingly insignificant event in the history of the second Mauretania. Nonetheless, an opera singer sang, a band played and fireworks saluted QE on her departure. Queen Elizabeth then went back across the Irish Se to Dublin. She docked at the Alexandra Quay, which is surrounded by cargo facilities. Thus, even though it is not all that far from the city center, it is better to take the complimentary shuttle bus to St. Stephen's Green. It is a very walkable city from there. To get to the final port of call, Queen Elizabeth had to sail out of the Irish Sea and then eastwards along the south of England towards the French coast. During this passage, the captain kept the ship in sight of land. Consequently, we were able to see the spectacular cliffs around Lands End. Along the same lines, when we were rounding the top of Britain earlier, we were often in sight of the beautiful Scottish islands such as the Isle of Skye. As mentioned earlier, St. Peter Port is a tender port. Here, the ship used its own boats to ferry guests ashore. The weather during the voyage was good with bright sun in Rotterdam, Liverpool and Dublin. In the other ports, it was overcast but dry. In Scotland and in the north of Ireland, it was cool enough to require jackets.